After graduating from the Medical Arts Massage School in early 2005, Jennifer was recruited for the Hands on Health team by one of her former therapeutic techniques teacher, Laura Landsiedel. Laura was impressed by Jennifer’s attention to detail in her hands-on work as well as her comprehensive written treatment analysis. 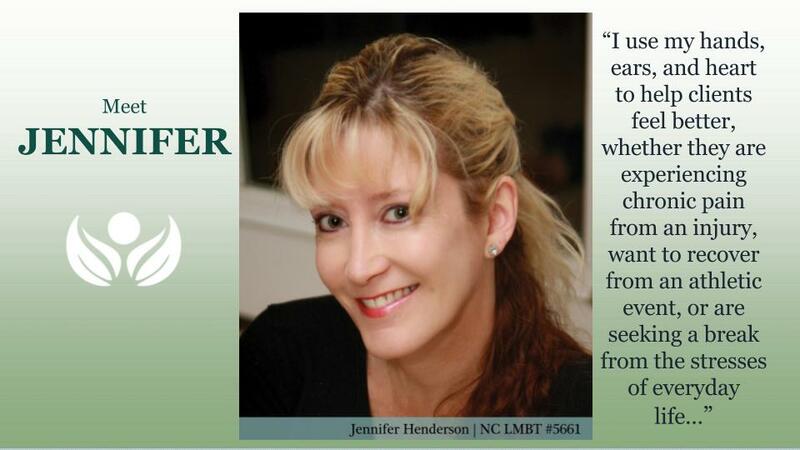 Jennifer’s continuing education includes I-NMT courses via Hands On Health’s CE program. Congratulate Jennifer! 2018 is her 14th year at Hands On Health! I would refer any one of my patients to her for a massage treatment…without hesitation. Dr. Elizabeth Etemad, DO; family practice and physical medicine. Jennifer’s massages make me feel so much better! I often have trouble with my neck and shoulders. Sometimes they are so stiff I can hardly turn my head. After my massages with Jennifer, the pain is much less and I can look over my shoulder again. Thanks for being there for me Jennifer! My low back feels so much better after massage. She seems to know exactly what to do to address the issue. The relief I feel lasts into the next week. With all the traveling I do, the massages are a great help. I just wish I could find a therapist like Jennifer in all the cities I travel to.